In the week that Phil Brennan left his role as Media Manager at Stockport County I wanted to share the first story he told me that I think may be unique in English football. The season when Stockport County had to change their shirt due to war being declared. This was not some phony baloney war between rival clubs or an issue with suppliers but all out international conflict. At County approached the start of the 1979 season they were still without a kit and time was running out. Mike Summerbee, who was on the wind down of what had been a successful playing career had been appointed player-manager for the 78/79 season. He was asked if he had any contacts who could assist in securing a new kit for the forthcoming season. 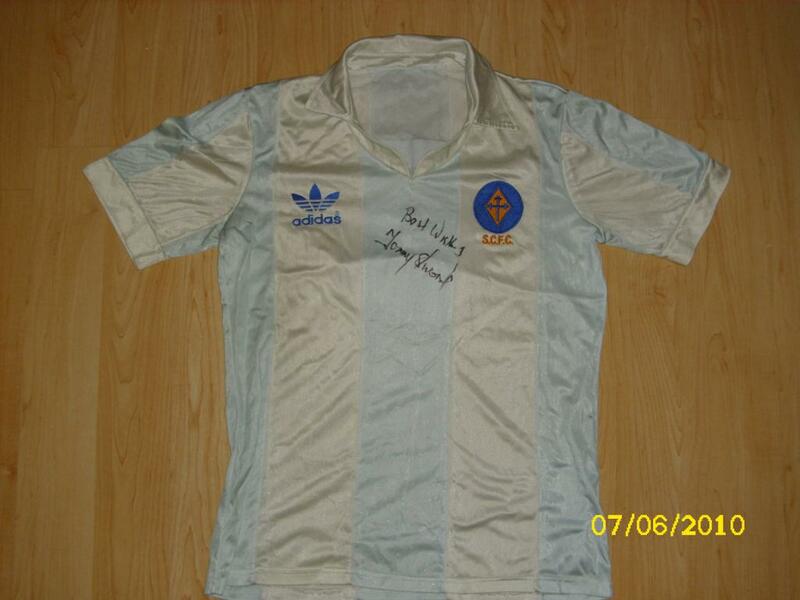 Summerbee had been sponsored by Adidas and approached the man behind the whole brand himself, Adi Dassler, to see what he could do. The previous summer had seen the carnival of football in Argentina for World Cup 78. The hosts were crowned Winners in a ticker tape extravaganza. Adidas just so happened to have a few spare sets of the iconic Argentina home strip which were soon on their way to Edgeley Park. County had always been associated with a royal blue colour when it came to home kit so a light blue and white kit was a definite change in form. 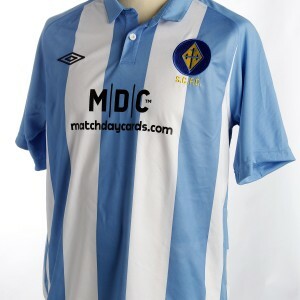 It took some convincing of the fans but with the Argentina badges changed to County the home strip was a success. The kit was used again in the 80/81 and 81/82 seasons giving County a continental feel the likes of which Greater Manchester hadn’t seen. Any history buffs however know what happened in April 1982, the Falklands War broke out and left County in a very difficult situation. The club hadn’t just been using shirts that were similar to the Argentina strip but Argentina shirts with the badge changed. A decision was made that the club couldn’t continue in the strip for fear of any repercussions at the club or players. For the first time ever in a season a club had been made to change a kit due to a WAR! Forget Manchester United changing shirts because they couldn’t see each other or clubs turning up without their kit. County finished the season in a white and black number before reverting to the traditional royal blue and white stripes the following year. The club have brought the Argentina type shirt back as an away shirt this year with fantastic results. The club shop has been selling out of the shirts (along with home and 3rd strips) fast as it harks back to a more successful time in the clubs history. As the clubs fans continue to hope that the side can get them back on the road to the football league once more. A nod to the past could help in keeping the belief that better times may be ahead. This entry was tagged Adidas, Argentina, Conference, County, england, Falklands, non-league, soccer, stockport, Stockport County, Stronger Together, Summerbee, war. Bookmark the permalink.